Was ever day more heavenly fair than this? From lotus islands in far summer seas. Every year, thousands of people walk over the large colorful mosaic embedded in the sidewalk on Cabrillo Boulevard, in Santa Barbara, California. 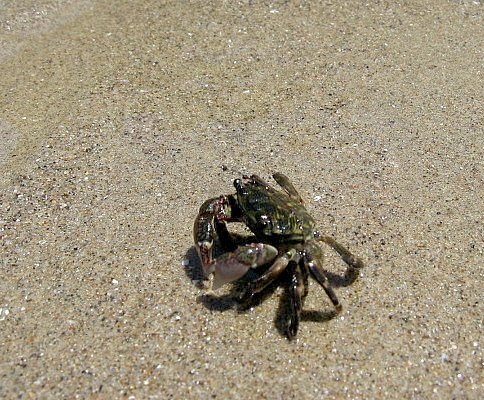 It lies about midway between Stern's Wharf and the Santa Barbara Harbor, next to the wide sandy beach. There is so much activity here: a steady ribbon of traffic along the boulevard - cars and trucks, Vespas and bicycles - constantly flows along the street; fishing boats, yachts, and sailboats glide near the shore toward the open Channel, while others move to and from the busy harbor. There are hotels, restaurants, shops, and parks nearby. It is easy among all the activity to overlook this beautiful work of art. 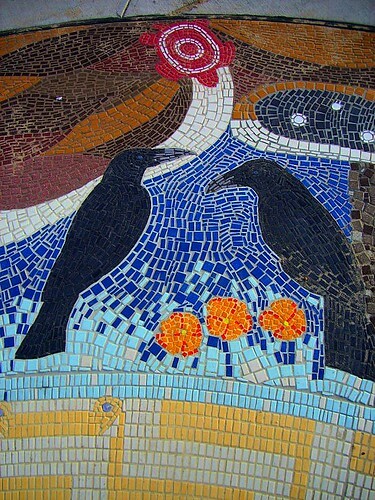 It is a beautiful mosaic, but it is so much more than that. It is the Syuxtun Story Circle, a pictorial storyboard created from the legends, stories, and myths of local Chumash clans. It was offered as a gift to the community, an opportunity for us to be reminded of an ancient wisdom that lives in the earth, trees, birds, water and skies around us. The mural contains colorful pictographs enclosed within the circle. You will see a group of men holding their open boat aloft, carrying a cache of opulent fish, a lavish bounty of riches from the sea. 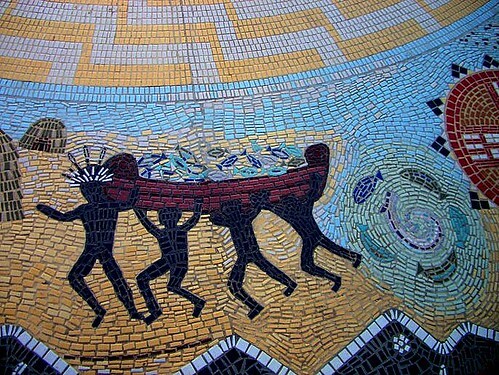 The mural holds the sun as center, around which the stream of life continues to whirl. The circle symbolizes the Chumash presence in the natural and the spiritual worlds - complex, interwoven, beautiful, intrinsic - Divine. Pause for a moment to consider the blank and pregnant space between each tile. Look up from the circle, toward the mountain. You will notice that you stand before a crosswalk offering you passage across the busy street. When the traffic signal allows, follow the path that bisects the stream of now - noise and traffic, people, music, business, laughter. On the other side, you will land on the shore of antiquity. At the height of the Victorian era, this was the site of a succession of large, magnificent hotels. The palm trees lined the long driveway that led to the front door of fabulous hostelries that attracted tourists from every corner of the world. 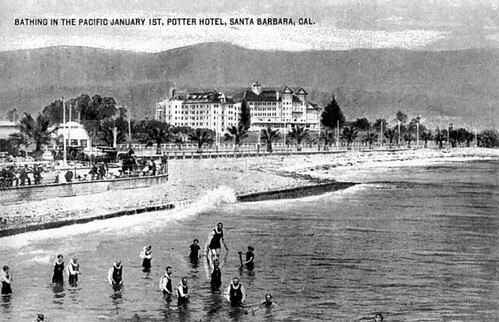 At the end of the 19th century, Santa Barbara became known as The American Riviera, a playground of leisure and beauty. 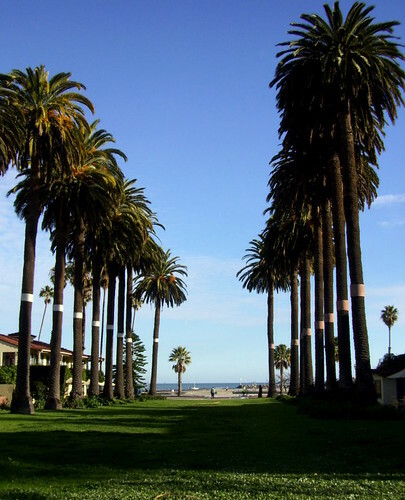 At first, visitors could access Santa Barbara only by boat or stagecoach. Once the railroad arrived in 1887, the influx of tourists increased. The charms of Santa Barbara: its great ocean boulevard, its fine mountain drives, its beautiful plaza and bath house, its fine Hotel Arlington and the magnificent Hotel Potter (just completed on Burton Mound and costing five hundred thousand dollars), its perfect climate the year round, its mountain and valley tours, its fishing and boating and bathing, its horseback riding, polo playing, golfing, yachting - all these are so common to Santa Barbara as to seem hardly necessary to mention. The city is an educational and artistic center. It is the resort home of many Eastern people of wealth who come to spend leisure time here in their magnificent country places. The city, of course, is well kept. It has paved streets, good electric car system, good lights, good water, and is well built. The Potter Hotel, The Belvedere, and finally The Ambassador Hotel, were all sited here. Each, in their turn, offered visitors a first-class vacation experience, right at the edge of the Pacific Ocean. Most visitors came from the East Coast of the United States, and from Europe. They were an exceedingly wealthy group who could afford to travel to this remote place, to enjoy the warm and flowering winters, the country clubs and beautiful mountain drives, "sea bathing", and other entertainments. At that time, there were glamorized and romanticized stories of how the Americans tamed the "Wild West". Many viewed it to be a colorful drama, full of battle and pagentry. In truth, as we all know, manifest destiny was a pyrrhic victory - with only the most monied, elite class of Americans emerging as "victors". And here, at the furthest edge of the frontier, there were vivid stories, erroneous but dramatic depictions of the indigenous people who lived here for thousands of years. Those stories certainly must have sparked the imagination of wealthy travelers who wintered in Santa Barbara, and added a certain élan to their months spent at the Potter, or the Arlington Hotels. Lewis T Burton, who had attained renown in Kentucky as a hunter, was attracted to this section by its reputation as a hunting ground for the sea otter. He afterwards engaged in business here, and the old Burton homestead on Burton Mound was a noted landmark until it was removed to give place to the Potter Hotel. This mound was also remarkable as having been the site of an Indian village for countless generations for it is largely made up of the refuse and kitchen middens that accumulated during its long occupancy as the capital of the native villages in this valley. When the excavations were being made for the foundation of the Potter Hotel, every furrow of the plow turned up some relic of by gone ages, and two rooms of the basement of the hotel are still devoted to the storage of the great quantity of antiquities unearthed during its construction. This was the original site of the village named, Syujtun. By the time the wealthy American tourists had arrived, few Chumash were left, their population decimated by "manifest destiny". But their spirit was never diminished. The Chumash heirs are a vital presence in the community; theyoffer many educational and cultural opportunities for us to share. As you walk the length of the grassy park, to the north, you will see a large boulder at the far end, next to Mason Street. Notice the brass plaque that marks California Registered Historical Landmark - No. 306. It is the State of California's quiet and humble acknowledgment of the ancient village of Syujtun, the ancestral home of Santa Barbara's Chumash people. A detailed assessment of the human remains found here was made by New York University College of Dentistry professional staff, in consultation with representatives of the Santa Ynez Band of Chumash Mission Indians of the Santa Ynez Reservation, California. At an unknown date, human remains representing a minimum of one individual were removed from the Burton Mound, Santa Barbara County, CA, by an unknown individual. In 1924, the human remains were acquired by Frederick Hodge. 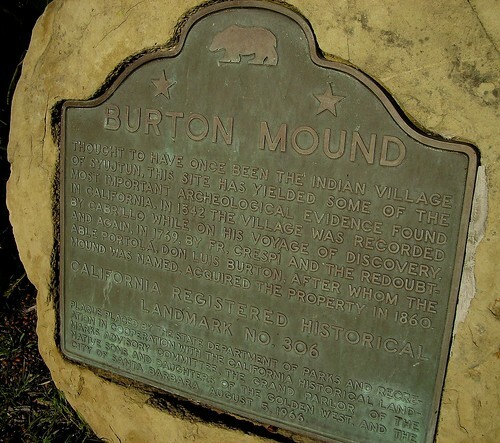 Museum of the American Indian records list the locality of origin as the Burton Mound, Santa Barbara, CA. The morphology of the human remains is consistent with Native American ancestry. Burton Mound was located at the Chumash village of Syujtun at the time of Spanish contact, in 1542. The inhabitants of the village were identified as Barbareno Chumash. Use of the mound stopped in the early 19th century and the Spanish settled in the area. Artifacts found in the mound suggest that it dates to the Prehistoric and Protohistoric phases of the Late Horizon. 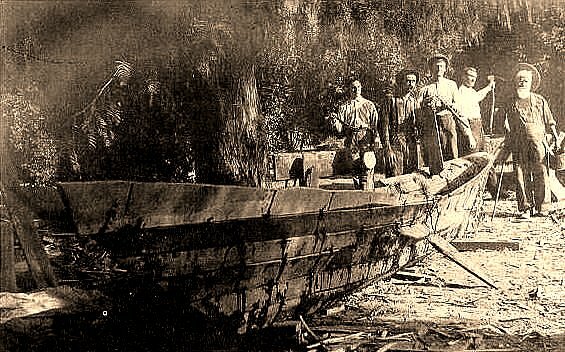 Our people once numbered in the tens of thousands and lived along the coast of California. At one time, our territory encompassed 7,000 square miles that spanned from the beaches of Malibu to Paso Robles. The tribe also inhabited inland to the western edge of the San Joaquin Valley. We called ourselves “the first people,” and pointed to the Pacific Ocean as our first home. 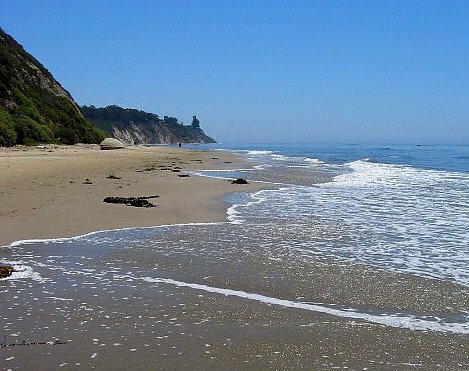 Many elders today say that Chumash means “bead maker” or “seashell people.” The Chumash Indians were able to enjoy a more prosperous environment than most other tribes in California because we had resources from both the land and the sea. The Barbareno Chumash were a peaceful, sophisticated, and advanced society. As their environment was so hospitable and abundant, it allowed for the development of a complex artistic, spiritual and ceremonial life. Their knowledge of the land, sea, plants, stars, and the deepest inner realms of man, were inculcated from more than 10,000 years of instruction from Mother Nature herself. 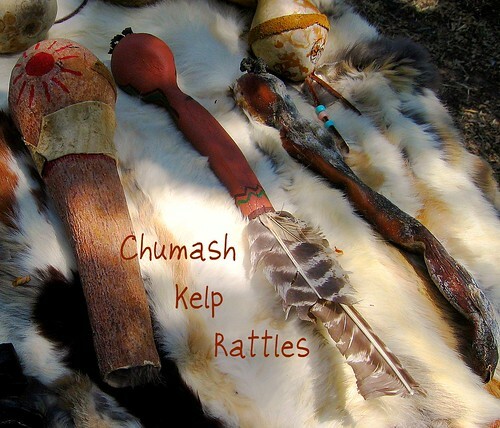 Today's Chumash people continue to nurture us all with contributions from their rich heritage and culture. 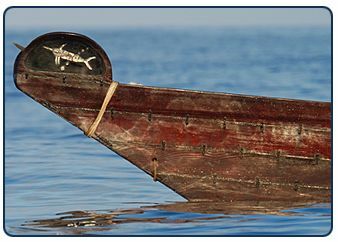 There are many opportunities to learn more about the ways of the Chumash and their incredible reign as true custodians of this corner of the Pacific Rim. If you are not able to visit Burton Mound in person, but would like to know more about the Chumash people, visit the Santa Ynez Chumash website, or the Santa Barbara Museum of Natural History website. And now, before you leave the Community Park (even if only in your imagination), stop for a moment and listen for the voice of this place. The very place you stand has been a cradle of society for 13,000 years. With the mountains at your back, look toward the beach, the ocean, the islands. Imagine the the vibrant village and its residents who flourished here for centuries - before trucks and Vespas, restaurants and rollerskates, ipods and sailboats. Imagine them paddling to the Channel Islands in their sturdy plank boats. 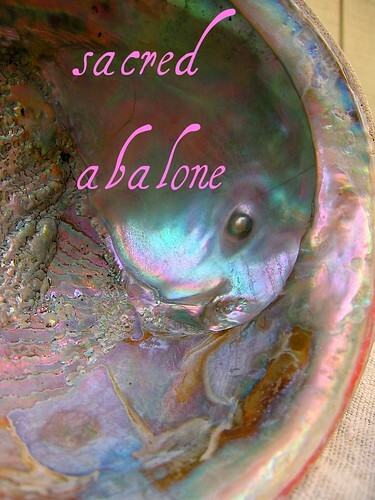 See them fishing, crafting jewelry, cooking, telling stories, tending their children. See them gathered around a fire at night, the entire Milky Way spilling above them as they danced and drummed and sang. There are sounds that can break through stone, and there are words that can give us understanding. There is no difference between the two, if we pay attention. Sometimes we need to be out in the sun, sometimes we need to be in the mountains, or in the oceans or the rivers. We need to stop and listen to the wind, the voices of the past, the breath of life. We need to feel nature, our wilderness, and be cleansed.